I’ve been wearing Aerin Lauder’s latest scent Tangier Vanille since July and have gotten soooo many compliments on it. Seriously, people stop me in the middle of the street to ask me what I’m wearing. It’s soft and feminine without being overly sweet. It was inspired by the rich and evocative scents of Morocco – with notes of amber, bergamot and vanilla. I wear this scent every single day and can’t leave for a trip without packing it. I stayed at my girlfriend Tammi’s house in Palm Springs over the summer and brought her the gorgeous Tangier Vanille bath and body set as a little hostess gift. The packaging is this fun ikat pattern (so my style!) and I love the body cream included in it. 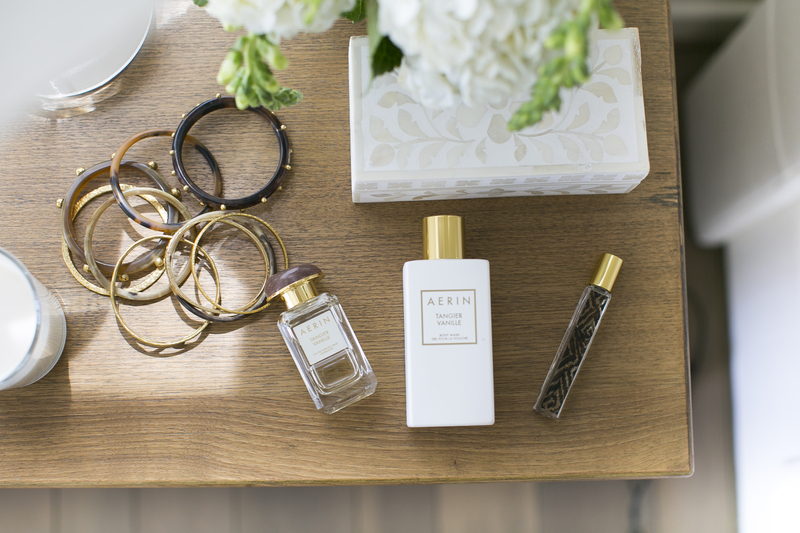 Aerin’s entire beauty collection is just as classic, timeless, and chic as she is. I admire the lifestyle brand she’s built – her home decor pieces are to die for, her beauty products create that effortlessly put together look we all want, and her blog constantly inspires me. Everytime I wear the Tangier Vanille scent I’m instantly transported to Marrakech – a place that has been on my must-see list forever! You can shop the entire Tangier Vanille collection here. Have a wonderful weekend! Special thanks to Aerin for sponsoring this post. Palm Springs is on my bucket list for a trip this year, her home looks stunning! I’m always looking for amaizng smelling perfume, need to go try out Tangier Vanille! Thanks for sharing and Happy Friday! These pictures are a dream and I am loving that bed. I wish there was a feature so that I could smell through the computer haha! But I’ll def need to try this out! Beautiful pictures. I’m definitely inspired to check out these products! Your bedroom and decor is a dream! I love your style!! So many beautiful pics!The bag and clothes are so stylish! Beautiful post. Where is that pretty make up pouch from? Love these bottles and packaging! Ive been looking for a new perfUme ever since i ran out of my calypso bottle! 28″” have to try this brand. Love the pretty packaging. Look gorgeous!Your blog is full of surprise. These clothes are lining your skin! They’re nice solutions for this season’s use! Pretty outfit! I love the coat. Wow, attractive site. Thnx .. I am dying to know where your Nightstand and chandIler are from!!!! me too! did you ever find out where the girlies chandelier is from?! Beautiful site! Would you mind sharing where the bead chandelier is from … it’s gorgeous! Hi! I was just wondering where your headboard is from; if you wouldn’t mind sharing, thanks!! Can’t believe no one’s asked about the hat…source, please!